When you're in the middle of packing up all your possessions to move in with your boyfriend for the first time in your life, things can be a bit stressful. There are boxes to find; books to pack; books to cull; books to hide*; bookshelves to move; CDs and DVDs to pack; at some point there'll be clothes to fold; bedding and towels to merge; kitchen equipment to squeeze into a smaller room; kettles to argue over; a cat to move as stresslessly as possible**... and in between all that there's work, eating, sleeping, breathing, dieting, socialising, exercising, and helping to organise an annual awards ceremony. If you don't get the image of a Very Busy Time then I have no idea how you cope with your life. Which is why, when it came round to a random weekday booked off for a day trip to Brighton we arrived in the town with absolutely no idea where to find a bookshop***. And no brainpower to work out how to find one either. It was an opportunity to relax, switch off and forget about all the stresses of day-to-day life. The internet was off, and we hurried to nothing. We wandered around, ate doughnuts on the pier, bought mementoes from arty boutiques and generally fell in love with our bright, quirky, and wonderfully chilled surroundings. It was exactly what I needed, if only we could stumble across a bookshop. I'd pretty much given up on that hope until we turned down a road in the North Laine. Pausing outside a lively pub, we spotted a man bending down to take in the doormat just as Brighton Books was closing up. I was pleased to have found what I now know to be one of many independent bookshops in the town, but also sad we were only there in time to see the door closed. I took a photo of the shop front for posterity and prepared to keep walking. Meanwhile my boyfriend had gone inside and asked the bookseller if we could just look in quickly. I wouldn't have dreamed of trying to keep the bookshop open longer than needed – booksellers have homes to go to too – but we were told we could have a couple of minutes. I loved the colour and bustle of Brighton, but entering the cool, slightly darkened bookshop and finding myself surrounded by floor to ceiling secondhand books and a general sense of calm was the icing on the cake. I liked it even more when contrasted with the general Brighton buzz drifting through the open door. I quickly located the fiction taking up a good space at the back and took note of diversity and quality (good and good). It hadn't occurred to me that I'd manage to buy a book and so be able to feature the bookshop on this blog as the result of such a short visit, but as I turned to leave a slim volume caught my eye. 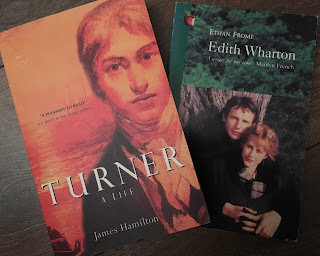 Edith Wharton is my all-time favourite author and so to be able to add her novella Ethan Frome to my collection without even trying felt like it was meant to be. Not only that, but my boyfriend also found a book: Turner, a life, by James Hamilton. There's not much more I can tell you. There's a comfy looking chair and the bookshop has a downstairs but it had been closed when we arrived. The bookseller seemed friendly enough, but anxious not to delay him further, I kept my chatter to the absolute minimum. It was a brief encounter but a happy one, and yet another reason for us to return to Brighton. Books were reasonably priced, so the bookseller didn't make much money out of allowing us those few minutes in his shop, but he did make us very happy. UPDATE: 28th July 2017: I've just received a very lovely email from this bookshop, sharing all the local bookshops in Brighton. Independent bookshops are lovely.